In newspapers across the country, the Associated Press says tenor Lawrence Brownlee "at moments even surpasses the late Italian superstar" Luciano Pavarotti. 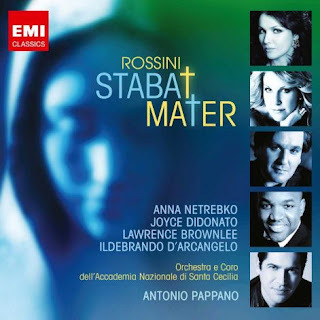 CLICK HERE to read Verena Dobnik's review of EMI Classical's new recording of Rossini's Stabat Mater, starring Brownlee, Anna Netrebko, Joyce DiDonato, and Ildebrando d'Arcangelo and conducted by Antonio Pappano. Amazon has samples from this exciting recording posted HERE. Praise for Jenkins and Kazaras. On her blog Opera Theater Ink, Los Angeles-based critic Carol Jean Delmar praises Speight Jenkins' "impeccable taste" and wise leadership at the helm of Seattle Opera, and calls Barber Stage Director Peter Kazaras "a masterful director because he enables non-noteworthy actors to become noteworthy singers who can suddenly act. How does he do it? By giving them stage business which enables them to become the characters they portray." Kazaras is currently in Cincinnati, auditioning singers for Seattle Opera's 2011/12 Young Artists Program with YAP Music Director Brian Garman. We hope on this blog to check in with them next week as they head for more auditions in New York City! It is great to once more be able to read this most informative (especially for Seattleites kiving abroad, like me in Germany) blogsite!!! Not having Internet, my only opportunity is at the State Library (Landesbibliothek) here in Schwerin, and that computer in the last couple of months (it seems) always struck when I attempted to reach yyour blogsite through it. Congratulations to Speight and Peter for being so honored by Ms. Midgette. And her kind words re Larry Brownlee I can also second!! Though I could not get your blogsite here, I could get to Berlin, where I experienced Larry last season as Almaviva in Katharina Thalbach's two-laughs-per-minute production of "Barbiere" at the Deutsche Oper there. Now playing in Berlin at the Komische Oper is a great de-pomped, de-nazified "Meistersinger"; no great singers in it, but believable and ideenreiche staging and sensitive (not bombastic) conducting by Patrick Lange, who is under 30 yrs old!